This waterfall has been on my list of “must see places” for several years. On a day trip to the foothills of North Carolina this weekend, I finally got the chance to visit and photograph it. The 60′ waterfall has an upper and lower cascades. It is situated on Moravian Creek in the southern part of Wilkes County. There is quite an interesting story behind the falls. Not too surprising is the fact that this site was once home to a thriving grist mill. The community of Moravian Falls was named after the waterfall, which in turn was named by the Moravians who settled here before moving to Old Salem. 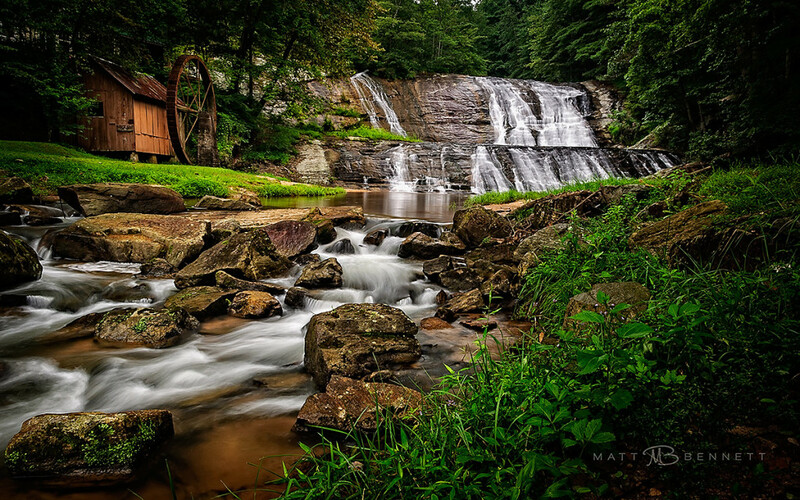 This entry was posted in NC Mountains, Waterfalls and tagged NC Mountains, NC Waterfalls, Waterfalls by Matt Bennett. Bookmark the permalink. Love your photo. It is the best! I would like to use it on a mailing I am doing for an upcoming Christian seminar in June at Moravian Falls. My husband is Dr. Paul G. Caram, author, teacher, and international speaker. We are doing a small retreat/’seminar there on a Friday night and Saturday, Father’s Day weekend. Is it possible to have a download of this photo in order to do this mailing. What would be the charge?